1969 Song of the Day is It’s Your Thing by The Isley Brothers. The Isley Brothers joined up with Motown in the mid-60’s- and had the big hit “This Old Heart Of Mine” right off the bat- then nothing clicked. They felt neglected in favor of the other big hit making machines- such as The Temptations, The Miracles and The Four Tops. They were second stringers and were unhappy with the situation. They were granted their release by Motown chief Berry Gordy and reactivated their own label- T-Neck Records. This was their first single written by Ronald Isley. It was inspired by Berry Gordy’s demanding hold on his artists after the Isley’s had left. 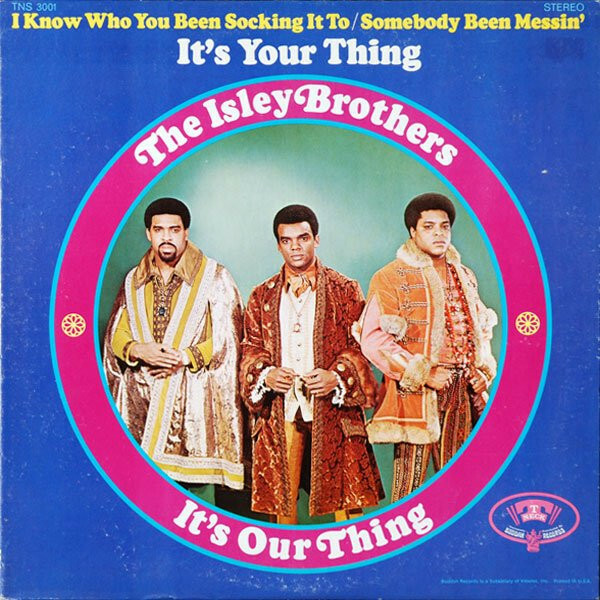 It’s Your Thing went to #2 on the Billboard Hot 100 singles chart, #1 on the US R&B chart and remains The Isley Brothers most successful single. The Isley Brothers are still around- in 2017 Ernie and Ronnie Isley collaborated with Carlos Santana on an album. Since the late 1950’s they have released 31 studio album and have had 13 Top 40 hits. Ronnie Isley has been in the group since its beginning in 1955. I still have this 45 single! Eclectic you own a piece of history. Hold onto it! Interesting back story on the group. Interesting they felt like second stringers because I think of this as a second string song. Sounds nice but goes exactly nowhere. “This Old Heart of Mine,” on the other hand, that’s starting lineup.